To the latest version of the top model in the three-row SUV, the 2018 Honda Pilot that went on sale first in Dec 2017, as Honda shows off its latest features, describing its desirability by all means! Family-Friendly is the name that’s been regulated in the car markets, so if you own a family that likes to travel together, adventure together, hold each other close and take the safety and comfort of the family very seriously then this is surely the vehicle you need to make a style statement of your own. Let’s go on a virtual trip of this bold but family-oriented SUV, the 2018 Honda Pilot, with amazing features that are user-friendly in many ways along with the in-vehicle connectivity, such as iPhone’s Apple CarPlayTM and Android AutoTM integration. Keep reading to find out what this new model, 2018 Honda Pilot has to offer! Intelligent Traction Management System, created to improve and easier mud, snow and sand handling. Rear bumper sensors, Blind Spot Information System (BSI) to alert the driver while reversing and vehicles approaching in the adjacent lane. The rear-view camera comes with three different angles you can choose from, normal, top-down and wide, hence reversing car made easy. Advanced Compatibility Engineering (ACE) body system, which exclusively is a Honda design that enhances occupant protection, frontal crash and collision. Honda’s Satellite-Linked Navigation System a feature consisting of 3D visuals of the map offers you lane guidance and live search functions too. HondaLink, the built-in mobile connectivity with the 2018 Honda Pilot that allows you to remotely start the engine, check fuel, control door locks all from your smartphone. The exterior is bold, sleek and pleasant styling making a statement how they are redefining modern family SUV. This three rowed SUV is legitimately good looking, elegant and sculpted with its nicely finished rear-ends. Presented in color range of up to eight. Tailored with high-quality, Honda Genuine Accessories, from 20-inch wheels to running boards to automatic Led Headlights, with bold front grille, Led Tail-lights and aggressive chrome layouts, this car has all that you ever wanted. 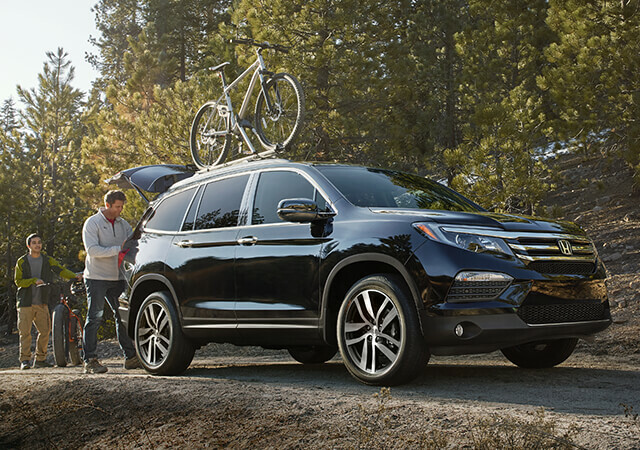 2018 Honda Pilot is not the top model in SUV’s in terms of its exterior but the intelligence connectivity, its spacious interior allowing cargo space along with a high level of utility with style are what keeping the brand at the top. An extra comfortable chair is available on the 2nd row, allowing the back passenger to enjoy the experience with extra comfort and luxury. Also, an easy access to the third row with a one-touch button, to bend seats forward is available on the second row’s seat. Leather seating throughout the cabin for extra comfort and a one-touch power moon-roof. The 2018 Honda Pilot, was thus recognized in 2017 by U.S. News & World Report as a Best Car for Families. With it being powered by a 3.5-liter, direct-injected i-VTEC® V6 engine, smooth-shifting 6-speed or 9-speed automatic transmission, with its fuel-efficiency along with its powerful engine 280-hp, all at a comparatively much more affordable rate in the market. For more information, get in touch with us by visiting Barrhaven Honda today!